Joey Gallo isn't concerning himself with when Adrian Beltre will be ready to take over at third base again for the Texas Rangers, which likely means a return to the minors for the young slugger. Gallo will just keep showing up at the ballpark until somebody tells him otherwise, an approach he believes helps him have days like he did Sunday. 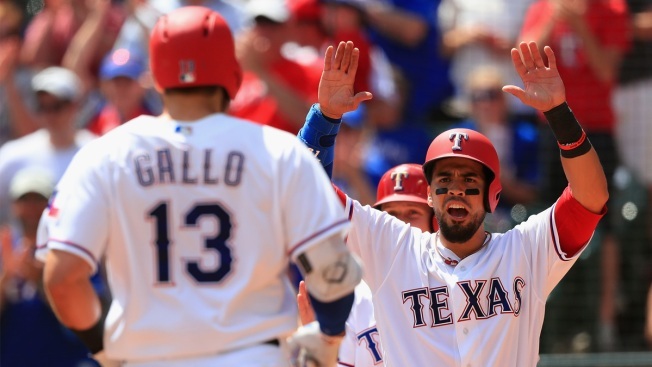 The 23-year-old homered and had a career-high five RBIs to back left-hander Martin Perez, and the Rangers beat the Oakland Athletics 8-1 on the first day Beltre (right calf) was eligible to come off the disabled list and resume his chase for 3,000 hits with 58 to go. It's the third year with at least some time in the majors for Gallo, the first two accompanied by anticipation for a player with 128 minor league homers the past four seasons. "This year I don't really have any of that noise in my head," said Gallo, who has two homers while starting all six games in place of Beltre. "I just show up. It's nice because you just kind of get to approach it as a game again and not this big event and there's a lot of hype around it." Gallo's three-run homer was the last of three straight hits in the second inning — the only three allowed by Sean Manaea (0-1). The Oakland lefty struck out six straight and finished with a career-high 10 strikeouts in 5 1/3 innings. But he gave up six runs, five earned, and hit two batters, including Nomar Mazara with a glancing blow to the batting helmet. Mazara stayed in the game. Before the six consecutive strikeouts in the third and fourth, Manaea had a hit batter, a throwing error, a walk and a wild pitch. "That's just kind of one of those things I've mentally been working on," said the 25-year-old in his second big league season. "I feel like just having those mental reps, just knowing when to bear down and focus and really focus where I'm trying to throw the pitches, has been huge." Robinson Chirinos had a two-run homer and another RBI on a bases-loaded walk. Perez (1-1) allowed six hits and three walks with six strikeouts in 5⅓ scoreless innings to improve to 7-0 with a 1.48 ERA in eight home daytime starts since the beginning of 2014. Leading 3-0 in the fifth, Perez escaped a bases-loaded jam with one out, getting Ryon Healy on an infield fly and striking out Khris Davis. After Mark Canha doubled off Perez to end an 0-for-25 drought and put runners at second and third with out in the sixth, reliever Jose Leclerc struck out Josh Phegley and got pinch-hitter Matt Joyce on a deep flyout to right. "The ball Joyce hits, last night it's probably out of the stadium," Oakland manager Bob Melvin said. "Today the wind is blowing the other way. But we had our fair share of opportunities to get back." Gallo had a two-run single in the sixth to help the Rangers avoid their first 1-5 start since 2006. Oakland right-hander Jesse Hahn will take rookie righty Raul Alcantara's spot in the rotation Thursday at Kansas City after Alcantara gave up eight runs over two innings in a 10-5 loss to Texas in the series opener. Hahn replaced him and allowed two runs in six innings. Melvin didn't say it was permanent. "One start and out of the rotation, that's kind of difficult," Melvin said. "We're trying to play a hot hand." Texas closer Sam Dyson pitched a scoreless ninth with a seven-run lead after giving up eight runs in one inning over his first two appearances, both losses. While Matt Bush's wild pitch in the eighth cost the Rangers a shutout, Texas allowed only that run in the final three innings after coming in with a major league-high 17 runs allowed late. Rangers: Manager Jeff Banister didn't offer a timetable on Beltre. ... RHP Tyson Ross (thoracic outlet syndrome surgery) is scheduled for five innings in an extended spring training game Monday in Arizona. ... INF Hanser Alberto (right shoulder tightness) will continue his rehab Monday in Arizona. Rangers: LHP Cole Hamels (0-1, 4.50) goes in the opener of three-game series at the Los Angeles Angels on Tuesday. Athletics: RHP Jharel Cotton (0-1, 10.68 ERA) pitches for the A's in Kansas City's home opener Monday. The three-game set is the only series outside the AL West for Oakland in the team's first 26 games.